'The Winner Stands Alone' is a contemporary psychological thriller written by a renowned Brazilian author, Paulo Coelho. The event is set during the Cannes Film Festival and the target venue has been the Hotel Martinez throughout the story. The novel begins and ends with the clock ticking showing the day hours gradually shifting to the evening time and finally the night hours, and completing a full 24-hours time period. Within this period, the author has very tactfully sketched the minds of people through his protagonists' thoughts and mannerisms. The author, in his novel begins telling us that the contemporary world is more interested in gaining fame and power that result in bad consequences. The author has in fact portrayed the darker side of the glamorous world. Those people who are interested in fame and power are the ones who get trapped in the hands of the so-called 'The Super Class'. But, what I feel is that there is both the good and the bad things to everything. My opinion is that to aspire for fame and power are not bad. But, to misuse them is bad. I think, the author must have experienced something bad in his lifetime, so the result of this book. I was amazed by the thoughts and acts of the main protagonist, Igor, a Russian Millionaire who seemed to be a psychopath killing innocent people just to show his ex-wife, Ewa that how he still loved her and wants her to come back to his life. Ewa, on the other hand tried to forget about her ex-husband, Igor's killing maniac. The drama and the tension that evolved round the protagonists in a 24-hour period were really fantastic. I loved the way the author, Paulo Coelho has very beautifully highlighted the life of other protagonists like Gabriela, an aspiring actress, Jasmine, a young enthusiastic model, and Hamid, Ewa's husband. I find this book a touch of uniqueness, awe, thrilling, and very intriguing. The narratives and tension grew slowly and intensely is indeed praiseworthy. I find the main protagonist, Igor's talks, his perceptions of life, and his mannerisms intrigued me and humored me, especially when he had a conversation with Olivia. I must say that this is a Must Read book. 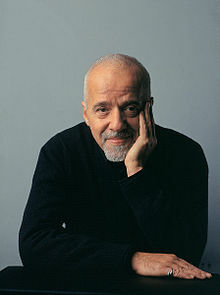 Paulo Coelho, born in Rio de Janeiro, Brazil in 1947, is one of the bestselling and most influential authors in the world. The Alchemist, The Pilgrimage, The Valkyries, Brida, Veronika Decides to Die, Eleven Minutes, The Zahir, The Witch of Portobello, and The Winner Stands Alone, among others, have sold 115 million copies in more than 160 countries.